Songpin (presumably the 80 year old ones), Red Label (50s), Red Label (no paper), Snow Label, Traditional Character Iron Cake (I wonder if this will be the same thing as what I had two days ago), 73 Small Green Label, 80s 8582, 80s 7542, 97 CNNP cake, 98 7542, 99 Green Big Tree. Sounds good? I thought so too, and it’s free!!! So I signed up. Now I hope they won’t try to do any hard sell while I’m there, or anything funny like that. I wonder if there will be too many people. They capped it at 30, but 30 is still quite a few for tea tasting. 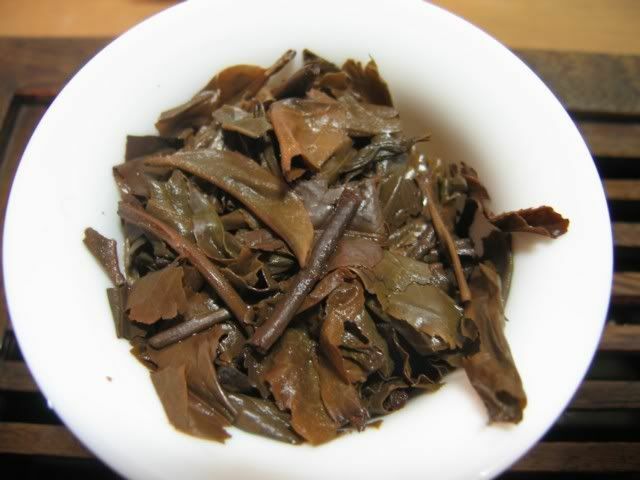 I think this is a company that recently established themselves here (they have stores in Taiwan) and they probably figured this is a good way to lure tea heads into going to their store to take a look at what they have to offer. 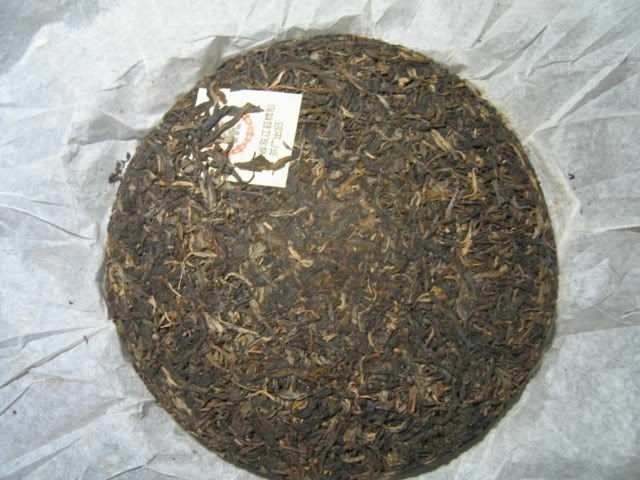 Knowing us puerh buyers…. we are such suckers and are probably a good target audience. Anyway, excitement about the tasting aside…. As promised, I opened up the Yuanyexiang today to give it a try at home. This is an iron cake — very solidly compressed. It took some prying to get it to break, and my attempts at trying to pry individual (largely intact) leaves from the cake wasn’t too successful, resulting in more broken bits than usual. I think it affected the taste a bit. 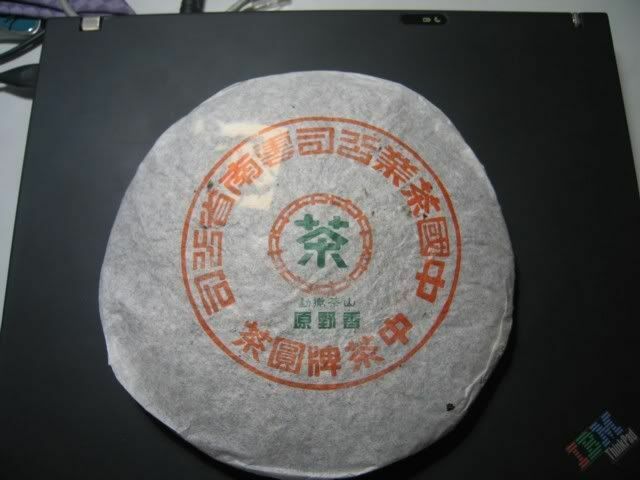 Oddly enough, this cake shares some of the same aromas as the other Mengku cake I bought that I reviewed a few days ago. It’s that undescribable smell — sort of woody, a little spicy, perhaps. I asked BBB if he knew what to call it, and he didn’t know either. 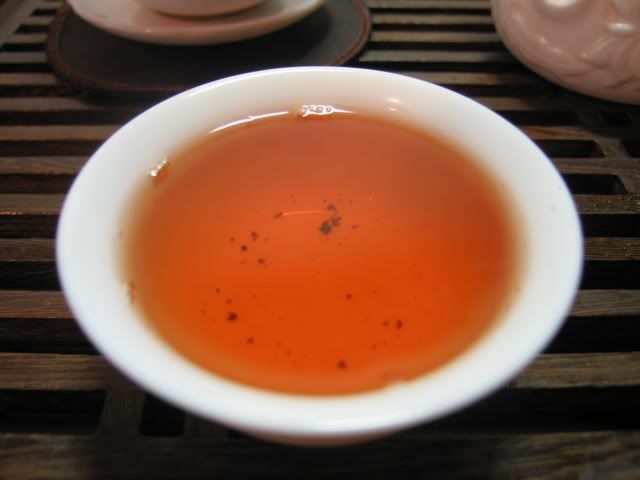 The tea tastes really rather similar to the 2002, except for one difference — I think there’s more of a huigan taste as well as pleasant feelings in the throat (what they call “throat aftertaste”) that the 2002 lacked. The first brew came out strong, partly because of the broken bits used in the brewing, and partly because I left it in a little longer than I probably should’ve. Although at this point it turned a bit sweeter, and the same metallic taste started to appear, just as the 2002. Why are they so similar? They’re not even from the same mountain. 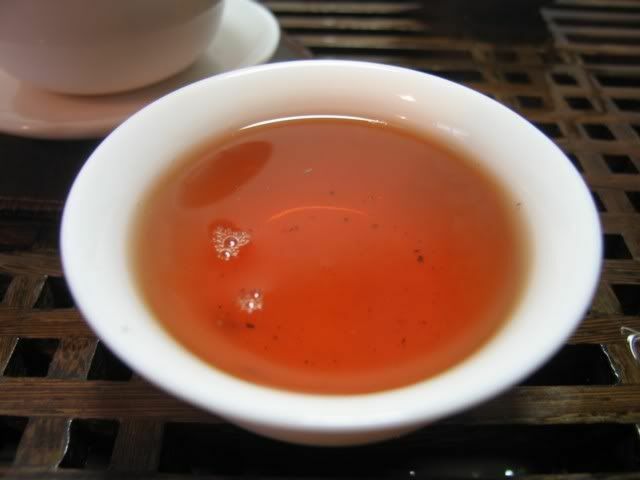 Again, what distinguishes this is the sensations in the mouth and throat, rather than the taste and aroma. You can see the colour turned a bit red already, as one would expect from about 5 years of age. I’m a little curious as to the progression of this tea, and how it will age going forward. I still think I smell hints of Chinese medicine in this cake. I’m debating whether to buy more of this. I know they have very few left at the store, and I know I am getting it for a fraction of the price I have to pay in HK for the same thing. Part of me tells me that I have enough tea, and that I should go to HK to try their goods out before purchasing. Part of me tells me that by that time, the price might’ve gone up here as well, or, worse, they would’ve sold their last tong. I think they’re down to one and half tong at this point. 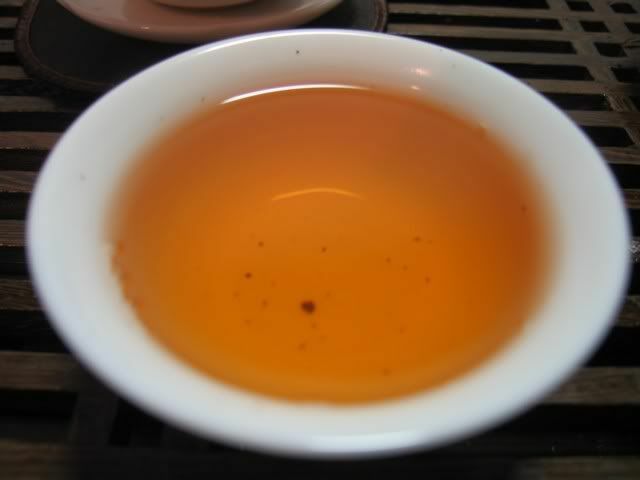 In terms of the basic quality of the tea, this is probably a notch higher than the 2002. The price reflects that. Hmmm, tough decision…. Wow ! Seem like an opportunity of a life time to taste those famous Pu. Can’t waite to see your tasting notes on those teas. 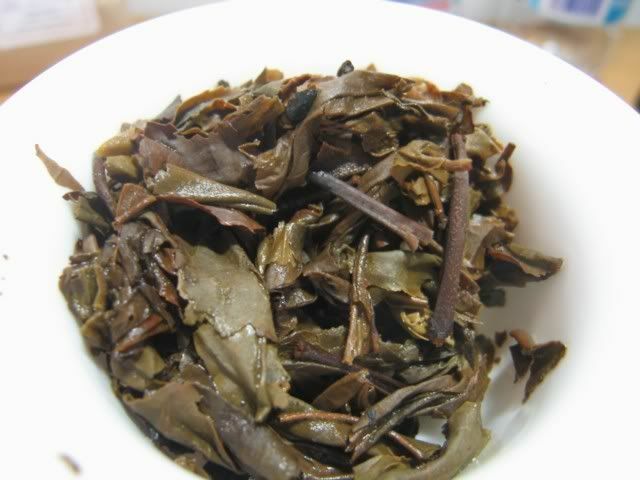 As far as Yuanyexiang,its sound like a good sheng to put away for aging.I wish I can get some.